Some of Hilary Clinton's emails on illegal private server beyond 'top secret,' requiring senior Senators to sign extreme non-disclosure. The controversy surrounding Democratic presidential candidate Hillary Clinton's illegal use of a private email server for work during her stint as US President Barack Obama's secretary of state is escalating, amid new revelations that some of her mails were beyond "top secret." Fox News reported on Thursday night that some of the emails were so sensitive and secret that senior lawmakers on key committees overseeing the State Department could not even read them, without first going through additional clearance procedures. 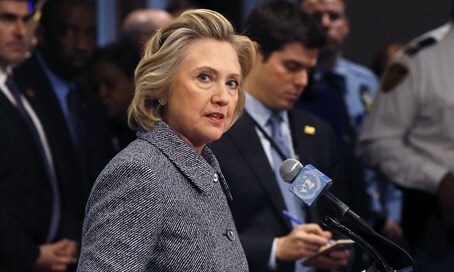 The emails contained information classified as a level beyond "top secret." A source familiar with the review process told the news site that senior members of the Senate Foreign Relations Committee, who already had high-level clearance, could not read the emails with contents from so-called "special access programs" (SAP) without additional security steps, including signing new non-disclosure agreements. Those new non-disclosure agreements were signed by the senior reviewers, even though they already had the highest level of clearance which is known as TS/SCI or Top Secret/Sensitive Compartmented Information. SAPs have access to them severely limited so as to protect the American intelligence community, and yet the content was sitting in Clinton's unsecured private email, despite the fact that Obama had signed in a law saying government email accounts must be used on official business. Intelligence Community Inspector General I. Charles McCullough III wrote in a letter to senior lawmakers last Thursday that "several dozen" emails were located in the review, including intelligence from "special access programs." The revelation makes Clinton's breach even more serious than previously thought after two emails were found earlier and classified as "top secret." According to former Justice Department official Thomas Dupree, another serious problem in the entire case is the way Clinton apparently ignored warnings from State Department IT employees that she should switch to a government account for the sensitive information. "If you have a situation where someone was knowingly violating the law and that they knew that what they were doing was prohibited by federal law because other people were saying, you're violating the law, knock it off, and they disregarded that advice and they went ahead, that's a very difficult case to defend," said Dupree. Clinton responded to the latest revelations that she sent beyond "top secret" information, telling NPR, "this seems to me to be, you know, another effort to inject this into the campaign, it's another leak." "I'm just going to leave it up to the professionals at the Justice Department because nothing that this says changes the fact that I never sent or received material marked classified." Belying Clinton's claims, the content in the mails is itself classified, with the markings on the documents having no bearing on that status. Last September, National Security Administration (NSA) director Mike Rogers admitted Clinton's server was a severe security risk and a probable target of foreign spies. He echoed statements by former Defense Intelligence Agency director Michael Flynn, who last April said it was "likely" spies breached into Clinton's emails. Clinton's released emails also appear to show she would be hostile to Israel in office; in 2011 she mulled a plan by a senior aide to stir up Palestinian unrest, and in November she said she would impose peace talks on the Jewish state - a statement also made by Republican front runner Donald Trump shortly afterwards in December.